The first openly gay K-Pop singer hopes to start a movement of acceptance. 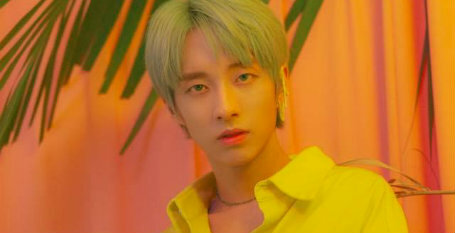 Holland, a 22-year-old K-Pop solo artist, is the first openly gay performer in the music genre and hopes that he can shift the public's perceptions of gay people in his country. In a recent interview with the UK's Metro News, he described culture as "the most powerful weapon" in this struggle. "It's going to take homosexuality coming out of the water," Holland said. "A lot of exposure and consumption. And a lot of people have to say it's not wrong." When the video for his single "I'm Not Afraid" was released last month on YouTube, it was given an age-restricted rating, allowing it only to be viewed by adults in South Korea. In the song's video, which is about Holland embracing his identity, there is a kiss between Holland and another man. The restriction has now been removed, and the video currently has more than 2.5 million views, but Holland said the controversy that surrounded it still stings. "I thought YouTube was a very open medium. I think there are many other music videos that are sexually appealing. I'm so upset," he told Metro News, but still is committed to being "a musician who tells my story." Brave soul go for it dude. You are doing a great thing.